Kpassagnon (ankle) is active for Sunday's game against the Bengals, BJ Kissel of the Chiefs' official site reports. Analysis: Kpassagnon missed Kansas City's loss to the Patriots in Week 6 due to an ankle injury but appears to have fully recovered. 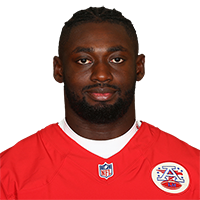 With Justin Houston (hamstring) inactive, Kpassagnon will slot into the starting defensive lineup. Kpassagnon (ankle) is questionable for Sunday's game against the Bengals. Analysis: Kpassagnon was limited in Friday's practice after participating fully to begin the week. With Justin Houston (hamstring) listed as doubtful for Sunday's game against the Bengals, Kpassagnon could be in line for a large defensive role if he's healthy enough to suit up. Kpassagnon (ankle) was a full participant in Wednesday's practice. Analysis: Kpassagnon sat out Sunday's loss to the Patriots due to an ankle injury but appears to have fully recovered. The rotational linebacker appears on track to play against the Bengals in Week 7. Kpassagnon (ankle) is inactive for Sunday's game against the Patriots, BJ Kissel of the Chiefs' official site reports. Analysis: Kpassagnon was seen warming up prior to Sunday's game, Adam Teicher of ESPN.com reports, but they ultimately decided that the linebacker was not healthy enough to give it a go against New England. With Justin Houston (hamstring) also out, Frank Zombo is in line to see plenty of additional work at outside linebacker. Kpassagnon (ankle) was a limited participant in Friday's practice and is questionable for Sunday's game against the Patriots. Analysis: Kpassagnon left Sunday's game against the Jaguars with the ankle injury and was unable to return. Friday was the only day the linebacker was able to put any work into practice, so he will likely end up being a game-time decision in New England. Kpassagnon is questionable to return to Sunday's game with an ankle injury. Analysis: Kpassagnon is used mostly as a specialist so his potential absence should only hurt the Chiefs in specific interest areas. It remains to be seen whether he'll be able to return to the contest. In the event that he's not able to, look for Breeland Speaks to step in where needed. Kpassagnon returned to practice Monday after recently dealing with a minor heel injury, ArrowheadPride.com reports. Analysis: Kpassagnon had missed a brief portion of training camp due to the heel injury, but he was back in pads Monday and figures to be available for the Chiefs' preseason opener against the Texans on Thursday. Kpassagnon racked up six tackles (four solo) and three tackles for loss, including two sacks, during Sunday's Week 17 game against the Broncos. Analysis: Kpassagnon made the most of his expanded role Sunday by bringing down the quarterback on two different occasions. He remains bound to the Chiefs through the 2020 season, but he is unlikely to see a consistent role in the defense barring injuries at outside linebacker. However, Kpassagnon should continue to provide depth on the outside and assist on special teams. 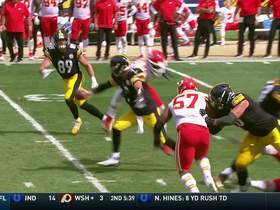 Pittsburgh Steelers quarterback Ben Roethlisberger completes unusual shovel pass for first down.